Here is a new Books in the Bible 2-Step Puzzle to help support learning in the classroom and homeschooling environment. 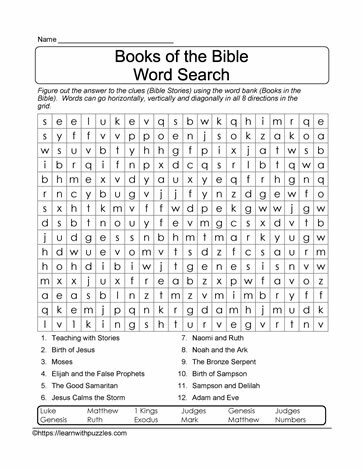 Suitable for students in late elementary grade 4,5,6 classrooms, this printable wordsearch puzzle will help reinforce both bible stories and books of the bible vocabulary. The bible story and bible book matching puzzle provides a complement to ongoing curriculum. This puzzle requires a 2-step process to complete. Step 1: use the bible story clues to identify the book in the bible where the story can be found. Step 2: locate the bible book in the puzzle grid.